In the roaring 21st century of iPhones and tablets, and hybrid technology, I marvelled at how they still travel with horse and buggy when all around them are the modern modes of travel. 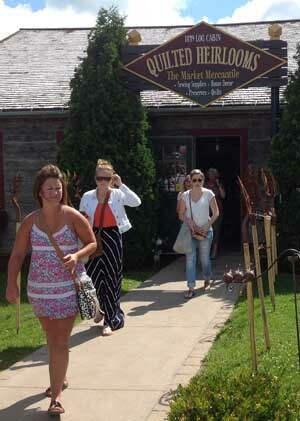 Now as we entered the famous St. Jacob’s Farmers’ Market, known to many as Mennonite Market, all this picture of the Mennonites and their life in the modern world came back to me. 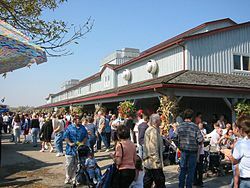 The St. Jacob’s Farmers and Flea Market, Canada’s largest year-round farmer’s market located about a 1 1/2 hours drive from Toronto and 8 km (5 mi) from the Village of St. Jacob’s, is a symbol of Mennonite life in Ontario. It is the centre of life for the approximately 4,000 Old Order Mennonites who still practice their traditional lifestyle that revolves around farming. The Market is the venue where many of their farm products and crafts are displayed and sold. The original 2,230 sq m (24,000 sq ft) building built in 1936 that attracted annually some one million visitors burned down on Labour Day of 2013 but reopened as a spacious and bright 3,159 sq m (34,000 sq ft) structure in June of this year which will undoubtedly attract even more. This image of a rural quiet traditional people fizzled away somewhat as I entered the market through automated sliding-doors combined with a sudden gust of cold air from a central air conditioning system. I thought it’s finally happened – the Mennonite community has entered the modern world of comfort, for them and for us. But then it got even more confusing. 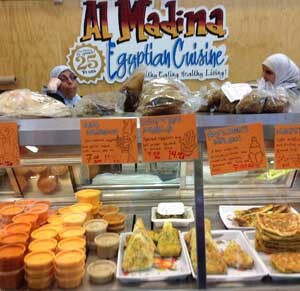 The first stop we made was a booth selling the foods of Egypt. I had to double-check my coordinates to make sure that I was in the Mennonite Market. 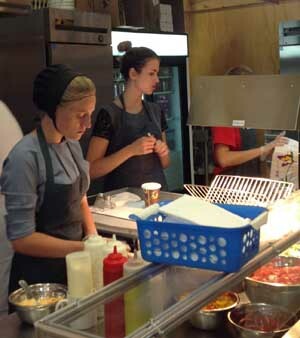 Following the aroma of donar kababs, better known as shawarma, and falafel we next ended up at a booth surprised to find a pleasant Mennonite young lady taking customers’ orders. This, plus pizza in the market, and Moroccan mahajeb, was an interesting take on the new Mennonite world of the 21st century. The effect of Prime Minister Pierre Elliot Trudeau’s multi-cultural policy was alive before us. 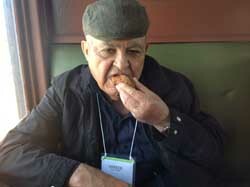 The ethnic foods of Canada were becoming united under the auspices of the Mennonites. But Mennonite culture predominates. The sausages and meats, the variety of cheeses, the preserves of jams and jellies (even low-sugar! ), pickles, syrups, pierogis, noodles, the freshly fried doughnuts and fritters with maple syrup, home-made chips and breads all remind us of the nonerasable identity of the Mennonites, preserving their heritage and traditions for the world to see at St. Jacob’s Farmers’ Market. Leaving the Market, we climbed aboard a tourist train, a train that connects to the heart of St. Jacob’s carrying visitors and Market shoppers alike to and from the Market. Volunteers operate this steam and diesel-hauled train. 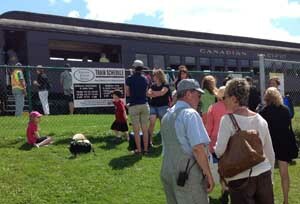 A vintage adventure in transport, the train starts at St. Jacob’s Farmers’ Market and ends at the village of St. Jacob’s after crossing the Conestogo River. Leaving the train, I thought to myself, this was a fulfilling day, tasting the Mennonite foods of the Market enhanced by ethnic foods and the world of gourmet delights. The Mennonite heritage of Canada continues to evolve making the country a richer place to live.